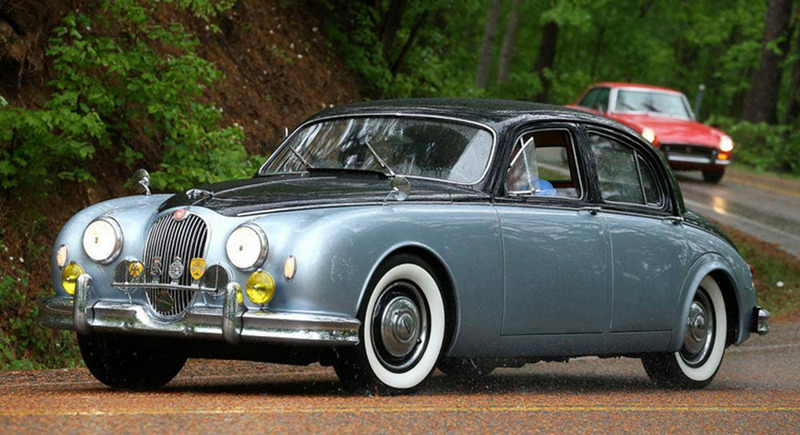 The Jaguar Mark 1, produced in 1955-1959, was a saloon car in the mid-size luxury /executive car class. It was Jaguar’s first small saloon since 1949, and was the first Jaguar with a unitary construction of body and chassis. Jaguar Mark 1 was a huge success that quickly attained much higher sales numbers than the larger and more expensive Jaguar saloons of the time. In total, 37,397 units were produced. The first version of the Jaguar Mark 1 had a 2.4 Litre engine. In February 1957, Jaguar announced a 3.4 Litre version that they had developed for the United States market. In the 1950s, Jaguar used the names Jaguar 2.4 Litre and Jaguar 3.4 Litre for this car. The designation Mark 1 wasn’t introduced until October 1959 when it was replaced by Jaguar’s new 2.4-litre Mark 2. In 1957, the same magazine tested a 3.4 L Mark 1. Now, they found a top speed of 119.8 mph (192.8 km/h) and acceleration from 0-60 mph in 11.2 seconds. 3.4 L Mark 1 cars successfully competed in many races throughout the world. For instance, both the 1960 and 1961 Australian Touring Car Championship was won by a driver in a 3.4 L Mark 1. In 1960, the winning driver was David McKay. The following year, it was Bill Pitt. 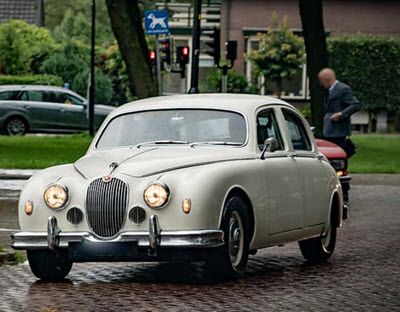 As mention above, the Mark 1 was Jaguar’s first car with unitary construction of body and chassis. The Mark 1 was initially offered with a 2.4 Litre short-stroke version of the XK120’s twin-cam six-cylinder engine. At the launch in 1955, it was rated at 112bhp net by the factory. Independent front suspension with double wishbones, coil springs, telescopic dampers, and an anti-roll bar. This was placed in a separate subframe, which was mounted to the body by rubber bushes. For the live rear axle, Jaguar opted for a simplified version of the D-Type suspension. It relied on semi-elliptic springs that were cantilevered to the main body frame, with the rear quarter section carrying the axle. Originally, the Mark 1 had 283 mm drum brakes. In 1957, disc brakes were introduced as an optional extra. The Mark 1 become renowned for its excessive understeer at low speed – it was actually better balanced at higher speeds than at lower speeds. Some contemporary sources theorized that this might have something to do with the fact that the rear wheel track was narrower (by 4.5 inches) than the front track, but this was probably an erronous conclusion. The Mark 1 had leather upholstery and polished walnut trim. Most of the dials and switches were found on a central dashboard placed between the driver and the passenger. The car was available in a basic version and a special equipment version. The special equiment version included fancy stuff such as windscreen washers, heater, tachometer, fog lights, and cigarette lighter. The Browns Lane plant in Coventry, England was built as a Second World War shadow factory managed by The Daimler Company Limited. In 1951, a few years after the end of the war, it was leased out to Jaguar Cars. Moving into the Browns Lane plant gave Jaguar much more production space than before, meaning that they could start making middle-weight executive saloon cars without having to give up anything from their existing range of cars. After listening to the requests of Jaguar dealers in the United States, Jaguar Cars began offering a version of the Mark 1 with a 3.4 Litre 210bhp (gross) engine in 1957. At this point, this engine was already used for the Jaguar Mark VIII. At the same time, wire wheels were made available as well. From 1957, both 2.4 L and 3.4 L Mark 1 cars were given a larger front grille, since the 3.4 L engine required increased cooling. 3.4 L Mark I cars also got a stronger rear axle. There were no rear-wheel covers, and the wire wheel’s were fitted with knock-off hubcaps. Prior to announcing the 3.4 L Mark 1, Jaguar Cars assembled 200 units and sent them to the United States. Soon thereafter, a fire in the factory destroyed the facilities where the 3.4 Litres were made. Previously only an option for Mark 1 cars intended for export, the three-speed Borg-Warner automatic transmission became available for all Mark 1 cars. Dunlop disc brakes on all four wheels became available as an optional extra on all Mark 1 cars.